30 Piece Custom Pastry Sampler in a Wooden Crate for sale. Buy online at Zingerman's Mail Order. Gourmet Gifts. Food Gifts. 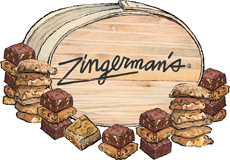 Create your own Zingerman's baked goods gift crate. Zingerman's fat, wallet-sized brownies. Huge, all-natural cookies. Luscious, buttery scones. Rarely seen Zingerman's Bakehouse specialties. Now you can take your pick. Create your own assortment of Zingerman's scones, cookies, brownies, and extra treats. Use the menus below to choose the pastries you'd like. Your selection is hand packed to order in our classic wooden crate with Zingerman's emblazoned across the top. Looking for different packaging or a different number of pastries? Check out all of our customizable gift options! If you'd like to create a custom gift box with other ingredients we're happy to help. Give us a ring at 888.636.8162.
more to go. You have selected of pastries. Click the plus sign + to select a pastry. Our Classic with toasted walnuts. Our classic but without any nuts. No-chocolate brownie with pecan praline, topped with sea salt. With amaranth and quinoa, not wheat. Made with muscovado sugar and juicy chunks of crystallized ginger. Made with real maple syrup, organic oats and giant red flame raisins. Made with fresh lemon juice, lemon zest, and candied lemon; soft and chewy. Bright orange zest and sweet bits of date in a freshly-milled, ancient grain dough. Loaded with tangy dried currants. Rustic, with organic rolled oats, pecans, red flame raisins and cinnamon sugar. Made with spicy, crystallized ginger. Made with candied lemon zest. Savory with Vermont cheddar and fresh rosemary. Savory with bits of Nueske's Applewood Smoked Bacon and Vermont cheddar. Buttery brioche with orange syrup, topped with almond frangipane. Buttery, flaky pie dough filled with raspberry preserves.